Grants from these funds, normally of the order of a few hundred pounds, are available to support geological field work at home or abroad. Grants from the Clough Fund may be awarded for fieldwork or other geological enterprise in any area, provided that a suitable Scottish connection can be demonstrated through the recipient or their institution, or through the work itself. Grants from the Mykura Fund are restricted to geological fieldwork in Scotland, with preference given to workers under 35 years old. Further information | Reports from previous years. Figure 1 – Our campsite in the Valley of Ten Thousand Smokes, looking towards Mount Griggs, Bob Gooday. In June 2017, support from the Edinburgh Geological Society allowed me to participate in the International Volcanological Summer School in Katmai National Park, Alaska. This involved staying in the Valley of Ten Thousand Smokes for ten days, looking at volcanic features in the Valley and the surrounding Katmai Cluster of volcanoes. The Katmai-Novarupta eruption in 1912 was the largest on Earth in the twentieth century, and completely filled a nearby valley with pyroclastic deposits. These deposits sustained intense fumarolic activity for several years, giving the valley its name. During our stay in the Valley, we looked at the pyroclastic deposits and landforms created by the 1912 eruption, which have been largely untouched by erosion or vegetation. The highlight of the trip was climbing to the rim of the crater at the top of Mount Katmai. The eruption itself happened at Novarupta, 10 km to the west, but the emptying of the magma chamber below Katmai caused the mountain to collapse, forming a caldera 4 km across. Observation of this caldera, and discussion of the processes at work in the accompanying eruption, have helped me with my PhD work on a similar-sized, but much older, caldera system on Arran, western Scotland. Download a more detailed article written by Bob about this project. Figure 2 – The caldera at the summit of Mount Katmai, formed during the 1912 eruption. Bob Gooday. 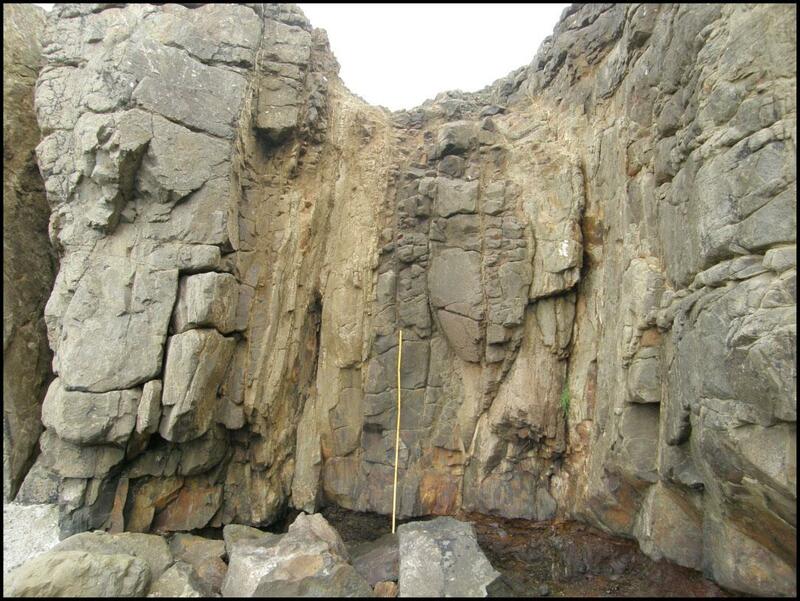 With the support of the Edinburgh Geological Society I was able to spend some time in addition to my planned field season exploring the Central Layered Intrusion (CLI) as part of the Rum Layered Suite in NW Scotland. 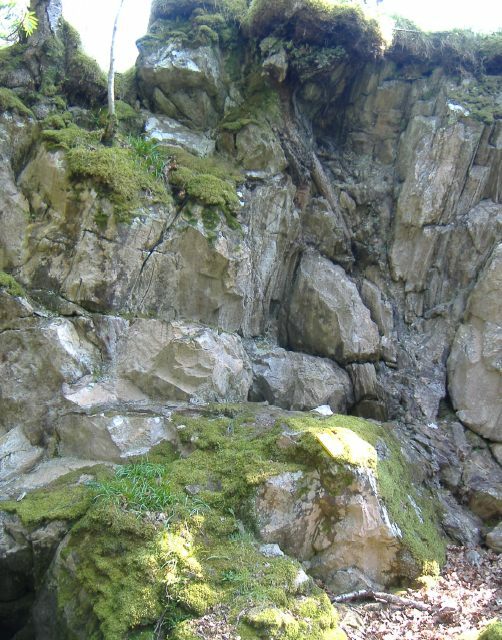 The CLI is perhaps the most poorly studied of the Rum Layered Suite, and the most lithologically complex, being composed of juxtaposed cumulate rocks such as peridotite (including harrisite), troctolite, and gabbro without pervasive layering (see image above). The CLI occurs closest to the Long Loch Fault in the centre of the intrusion, the presumed source of the Rum magmas which was purportedly active during the formation of the layered complex. As such, brecciation and deformation is widespread with metre sized blocks of foreign cumulate found incorporated within peridotites and troctolites. The purpose of additional study as part of my current PhD project was to investigate the occurrence of Cr-spinel seams within the CLI, which was actively deforming during its formation. A primary focus of my research is to elucidate the magma chamber dynamics within the Rum Intrusion using ubiquitous platiniferous Cr-spinel seams found within peridotite cumulates. My previous investigation has focused on the well-layered Eastern (ELI) and Western Layered Intrusions (WLI). 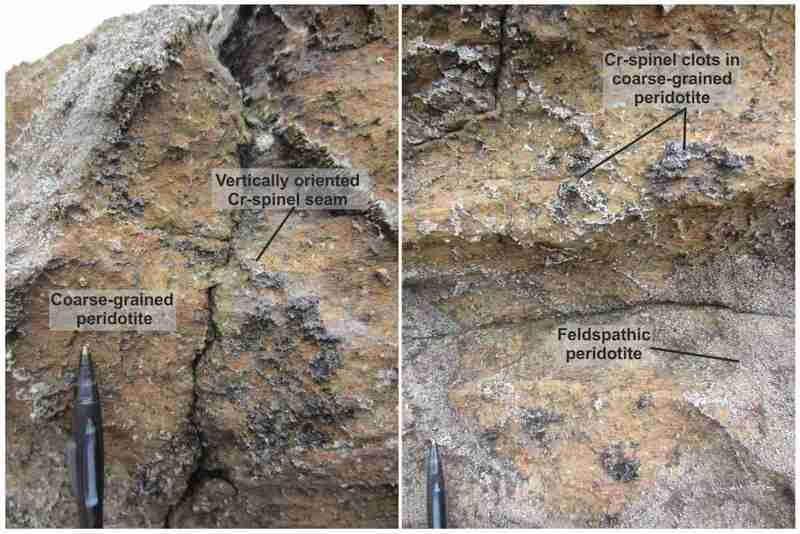 As Cr-spinel seams typically represent a replenishment event in layered intrusions, numerous Cr-spinel seams found within peridotite cumulates suggest multiple and potentially much smaller replenishment events. These Cr-spinel seams are also associated with harrisite, an unusual olivine cumulate composed of highly skeletal olivine crystals, comprising a key example of in situ crystallisation in layered intrusions. This lithology has also been suggested to represent intrusive replenishment into the crystal mush. The association with this intrusive and in situ lithology strongly suggests the platiniferous Cr-spinel seams also formed in situ, opposed to gravity settling commonly advocated in layered intrusions. The crystallisation of these seams in situ within the crystal mush has significant implications to the petrogenesis of Cr-spinel seams and associated platinum mineralisation in much larger layered intrusions such as the Stillwater Complex (Montana, USA), or the Bushveld Complex (South Africa) which hosts world class deposits of platinum mineralisation, and where intrusive replenishment has not yet been explored fully. While not as common as Cr-spinel seams found in the ELI and WLI, Cr-spinel seams do occur within the CLI, also hosted in peridotite. Perhaps not unexpectedly, Cr-spinel seams found within the unlayered CLI are not oriented in a particular direction as in the ELI or WLI where layering is strongly defined. Instead, these seams appear vertical, sub-vertical, or in concentrated clots within coarse grained harrisitic peridotite (see images above). Results of sampling and field investigation during 2015 will be incorporated into my current study to provide an intriguing parallel to well-layered peridotite cumulates and investigate the effects of magmatic deformation on the petrogenesis of Cr-spinel seams an associated platinum concentration in the Rum Layered Intrusion. Across the Ethiopian rift there are a series of young silicic volcanic complexes, many show evidence for having undergone significant caldera forming eruptions in the recent past and several show clear signals of ongoing unrest (such as ground deformation). Our knowledge of the typical size and reoccurrence interval of explosive eruptions from these volcanoes is extremely limited, and as a result the hazard posed to the several million people that live in close proximity to these volcanoes is poorly constrained. To bridge our current knowledge gap on the explosive activity of these volcanoes we are carrying out a geological mapping project of Aluto (Fig.1), a typical rift volcano that has a significant population living both on and within the vicinity of the complex, and is also the target for major geothermal development. In particular, we are studying the distribution of tephra (the explosive volcanic deposits of ash and pumice) to assess the physical parameters of these eruptions (e.g. mass and volume of erupted material, as well as the spatial patterns of dispersal). This fieldwork focussed on logging sequences of tephra exposed in a deep gorge cut by the Bulbulla River 5km west of Aluto volcano. These outcrops expose up to 50m thick sequences of fluvial, lacustrine and terrestrial sediments with interbedded tephra horizons. 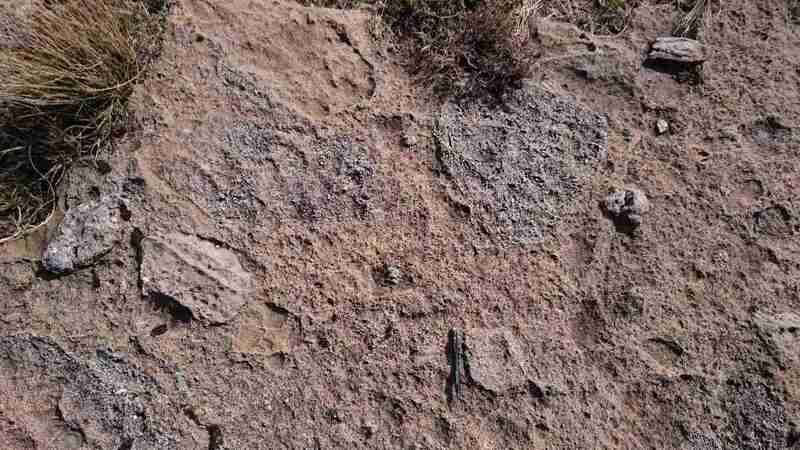 In the field we found evidence for 5-10 primary tephra horizons preserved in the last 20’000 years of stratigraphy. 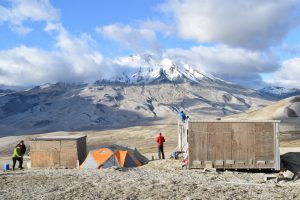 Future work will involve geochemical analysis of the pumice to chemically fingerprint eruptive units (and confirm whether or not they are derived from Aluto), and additionally, carbon dating of shells and charcoal to define time brackets for these eruptive events. Stratigraphic correlation of these tephra horizons will ultimately allow a step-change in our understanding of the explosive eruptive history of the volcano with which future hazard scenarios can be assessed. Crystal structural measurements of Cr-spinel crystals. Gemma Kerr of the University of St Andrews was awarded a grant in 2011 to undertake detailed mapping and chemical analysis of the Loch Maree Group (LMG) in northwest Scotland. These two-billion year old rocks are Scotland’s archive of the hallmark events that record oxygenation of the Earth’s atmosphere and unprecedented fluctuations in the global carbon cycle. The aim of the project was to help refine geological relationships in the Loch Maree rocks and perform high-resolution carbon and oxygen isotope analysis. The project has resulted in better documentation of one of the oldest and largest known Carbon Isotope Excursions (CIE) and will enable more robust age determinations of the Loch Maree rocks and better place them in Earth history. One month was spent mapping the Flowerdale and Cloiche marble belts and collecting 74 samples of multiple sections of each unit. The prepared marble samples were transported to the stable isotope facility at the Scottish Universities Environmental Research Centre (SUERC) for analysis. To help contribute to the geochronological efforts to constrain Paleoproterozoic CIEs, appropriate samples were collected for dating in the NERC Isotope Geoscience Laboratory (NIGL) in Keyworth (due to be completed in late January). 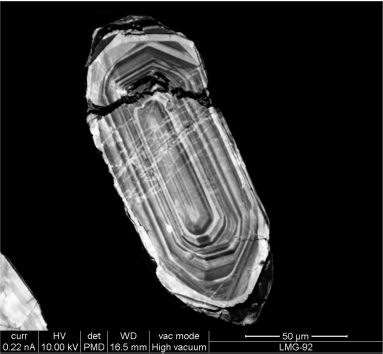 Figure 3: Cathodoluminescence image of a zircon taken from an intrusive gneiss body within the Loch Maree Group. Photo: NIGL. The results of the project have been highly satisfactory. The carbon and oxygen isotope analysis and XRF analysis confirm that there are distinct chemical signatures preserved in each of the marble belts. From this – and from mapping insights gained in the field – it can be inferred that each marble belt represents a distinct event in time. The Cloiche belt yielded delta 13C values as high as +13.5 parts per thousand, a signal similar to that recorded in the Lomagundi-Jatulian CIE rocks of the Fennoscandian shield. In contrast, the Flowerdale marbles yield delta 13C values around zero and therefore represent a return to the “norm”. The XRF results may be used to infer possible depositional settings for the carbonates. Of particular note are the elevated levels of trace metals (copper, zinc, vanadium and barium) which suggest that the Flowerdale carbonates have formed in a deep marine environment associated with “white smokers” – hydrothermal vents on the ocean floor. Due to the current levels of interest within the scientific community and the significance of the results, the data are being presented in lectures by Gemma Kerr and Tony Prave. 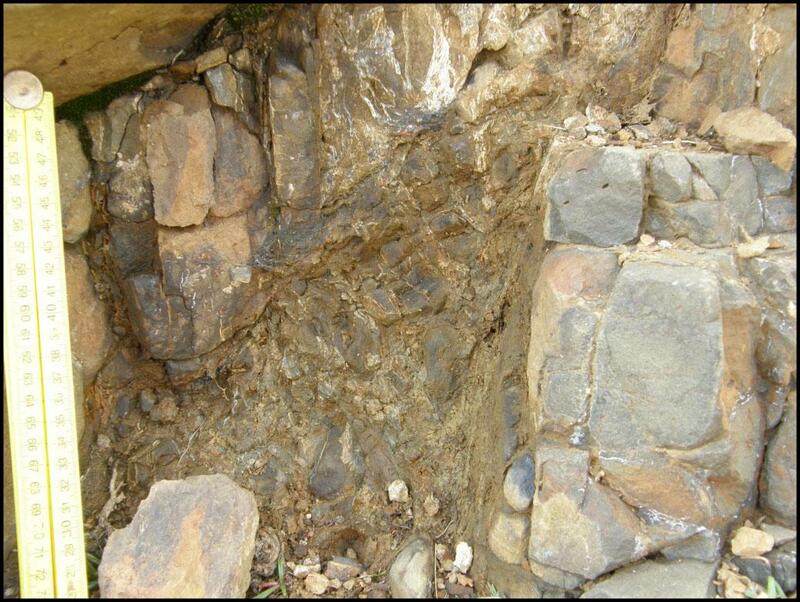 Fig 1: Fault breccia with mineralisation, Sumba, Suduroy. Rachael Ellen from the University of Glasgow (now at University of Strathclyde, Glasgow) was awarded a grant in 2011 to study the internal structure of faults in basalt exposed in the Faroe Islands as part of her PhD project. With basalt sequences becoming increasingly important for hydrocarbon production and as potential host rock for CO2 and radioactive waste storage, it is crucial to understand what effect faults within these sequences have on fluid flow. Fig 2: Fault zone in basalt and soil horizon, light brown areas are zones of alteration. 2m tape. Vagsheidi, Suduroy. The Faroe Islands provided exceptional exposure of faults in basalt, allowing detailed mapping (1:3 scale) of each fault zone studied to highlight different components within the fault that can affect fluid flow migration. These components include fault rocks i.e. breccia (Fig.1), gouge, cataclasite, and slip surfaces, and sites of previous fluid flow pathways, i.e. mineral veins and zones of alteration (Fig.2). Fault displacement ranged from 18cm to 6m. The faults mapped in the Faroe Islands are being compared with fault maps collected from sites in Scotland and Iceland. Together these will provide the basis of a conceptual evolution model for faults in basalt. This evolution model, along with samples taken from each site for micro-structural analysis, will ultimately lead to a conceptual permeability evolution model for faults in basalt sequences, allowing the spatial variability of faults and fluid flow to be predicted and modeled.